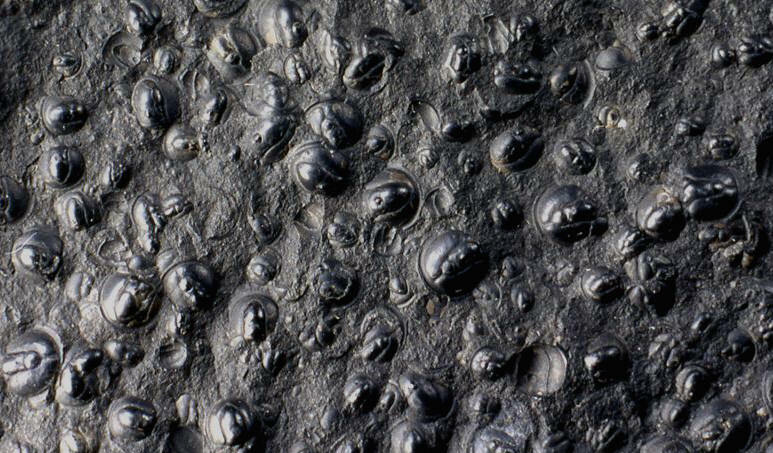 Well-preserved trilobites occur in Sweden’s Alum Shale Formation (Middle to Upper Cambrian). The limestone beds in this unit are often trilobite packstones. 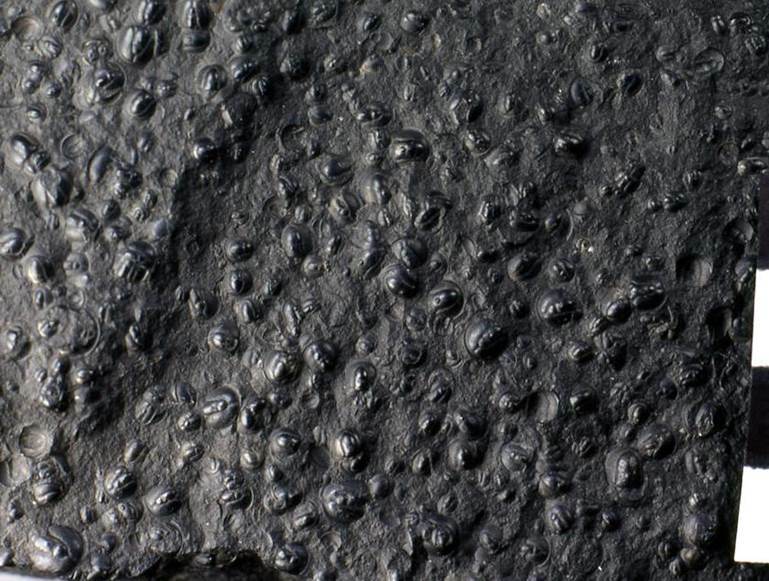 Shown below is a black, fossiliferous packstone from the classic locality of Andrarum, Scania, southern Sweden. These rocks are slightly petroliferous, and release a distinctive oily smell when broken. Early Swedish workers called these rocks “stinkstones”. The stinkstone shown below is packed with numerous disarticulated heads & tails of the common agnostoid trilobite Agnostus pisiformis. Some concretions in the Alum Shale Formation have Agnostus pisiformis trilobites with preserved soft parts. They are part of the Orsten Lagerstätte, which includes preserved soft parts from the larval stages of several invertebrate species. Agnostus pisiformis (Wahlenberg, 1818) from the Alum Shale Formation (Cambrian) at Andrarum, Sweden (YPM 36654, Yale University’s Peabody Museum, New Haven, Connecticut, USA). Centimeter scale. Agnostus pisiformis (Wahlenberg, 1818) from the Alum Shale Formation (Cambrian) at Andrarum, Sweden (YPM 36654, Yale University’s Peabody Museum, New Haven, Connecticut, USA). 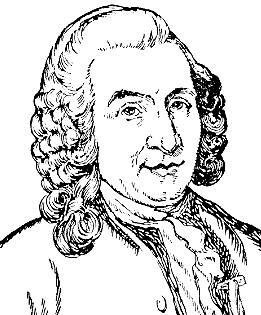 Left: Magnus von Bromell (1679-1731) was an early Swedish naturalist. 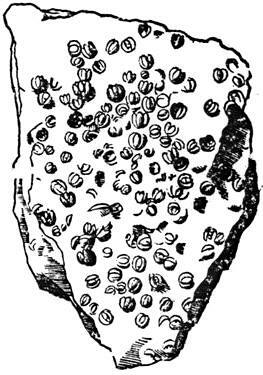 He first described & illustrated Agnostus pisiformis stinkstones in 1729 . From Reyment (1974). Right: Bromell’s (1729) figure of black fossiliferous packstone from the Alum Shale Formation Cambrian) with abundant Agnostus pisiformis cephala & pygidia. 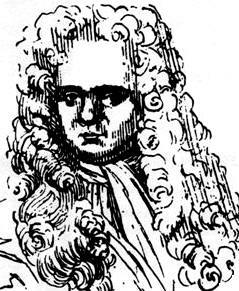 Carl Linné (Carolus Linnaeus) (1707-1778) From Wilson (1994). Linnaeus gave another description of Swedish Agnostus pisiformis fossils in his 1751 book Skånska Resa [Travels in Scania]. He likened the disarticulated heads & tails to compressed peas. The species name pisiformis is Latin for “pea-shaped”. In 1768, Linnaeus formally named these fossils using the system of scientific names that he invented in the 1750s. Linnaeus referred to this fossil using the genus-species-subspecies name Entomolithus paradoxus pisiformis (“pea-shaped paradoxical stone insect”). Göran Wahlenberg described & illustrated this species (as Entomostracites pisiformis) in his 1818 monograph “Petrificata Telluris Svecanae”. Wahlenberg is often given credit for naming the species, although Carl Linnaeus was the first to name it in 1768. 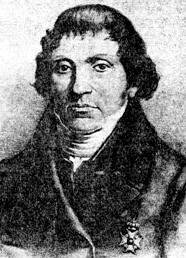 Left: Göran Wahlenberg (1780-1851). From Reyment (1976). Right: Wahlenberg’s (1818) figure of Agnostus pisiformis from the Alum Shale Formation (Cambrian) of Västergötland, Sweden. The original figure is inverted - Wahlenberg misidentified the head as the tail & vice versa). The cephalon (head) has been designated as the lectotype specimen for Agnostus pisiformis (Wahlenberg, 1818, plate 1, figure 5). The original specimen still exists (as PMU Vg. 819, housed at the Palaeontological Museum of the University of Uppsala, Sweden), and was figured by photograph in Reyment (1976). Wahlenberg himself collected this material on 8 July 1817 from Alum Shale Formation exposures at Hönsäter, Västergötland, Sweden.